Shopkick, a shopping rewards app that’s currently ranked only #1233 on the App Store, is expanding its focus. The company today is launching a new feature called Shopkick Grocery, to move its business into the area of grocery awards. The app will dole out gift cards to consumers who engage with brands’ content, including by scanning barcodes on products, making purchases, watching videos, trying suggested recipes and more. This means Shopkick will now compete with other shopping deals, discounts and rewards apps on the market today, like Snap by Groupon, Checkout 51, Favado, SavingStar, Coupons.com, Ibotta, Flipp, and others aiming to replace the retailer’s circular. However, these sorts of apps have niche appeal. There is a select group of consumers – typically those willing to engage in activities like clipping coupons, for example – who are willing to trade their time and attention for cash or discounts. Shopkick Grocery joins this cohort, offering featured content and products from 34 big-name brands, including Barilla, Bayer, Clorox, Mentos, Purina, Ragu, Ben & Jerry’s, Coty, Dole, Ruffino Wines, Sargento and Starbucks, at launch. The app will also work in over 37,000 U.S. stores, like Kroger, Publix, Safeway, Target, Walmart and others. But instead of being a standalone application, Shopkick Grocery is rolling out as a new feature within the main Shopkick app. Shopkick Grocery will offer its rewards currency, dubbed “kicks,” which can be exchanged for free gift cards at stores – including those outside the grocery business, like TJ Maxx and Starbucks. The participating brands will fill the app with content that serves as another means of reaching customers in an era where TV, newspaper, and magazine ads no longer have the reach they once did. Instead, app users are prompted to view lookbooks, watch videos, and tap on offers for products, which can also be added to an in-app shopping list. The included recipes will integrate with the shopping list, too. At launch, there are a few recipes available featuring its brands’ products, like Starbucks Coffee Glazed Ham and Hidden Valley Ranch Buffalo Chicken Pizza, for example. This is an area that Shopkicks’ grocery deals competitors haven’t tackled, as their apps are more focused on offers and deals, and less on how to make those offers a part of a consumers’ weekly meal-planning activities. 65 percent of Shopkick Grocery beta testers said they would try new products if they could earn kicks, and 62 percent said they would shop at a different store in exchange for kicks. Those claims still need to be proven out through real-world usage, though. 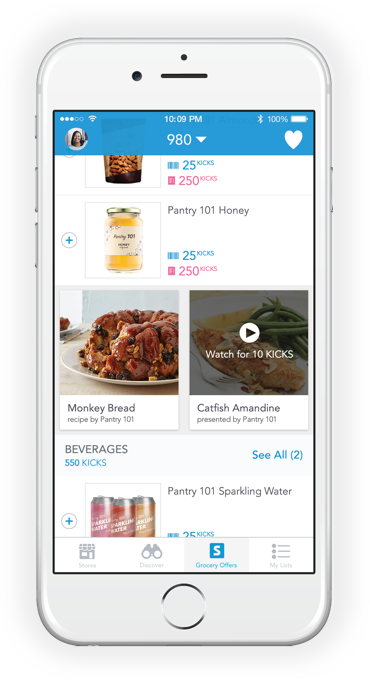 Shopkick’s business model with grocery is pay-for-performance, with partners working with the company to determine their specific ROI – like in-app content views, products scanned or sold. Shopkick only earns money when the action is completed. News of Shopkick’s expansion to grocers was previously announced, with a planned April debut. Shopkick’s CEO Bill Demas claimed last fall the app has 23 million monthly active users, and has been working with retailers to integrate with their beacon technology to allow shoppers to earn points by walking into stores. However, grocery shopping is something that people do more frequently – as often as every few days or weekly, for example, which could increase Shopkick’s use. According to data from App Annie, users spend over 2.5 hours per month in the app. Shopkick also says it just had its highest revenue quarter in company history, and has more brands and retail partners on the platform than ever before. To date, Shopkick has driven over 200 million store visits, over 270 million product scans in aisle, and over $2.5 billion in total sales from brand and retail partners, the company told us. Shopkick Grocery is available on iOS and Android, within the Shopkick app.